Items can removed from clear plastic display box and arranged on table, tray, etc. 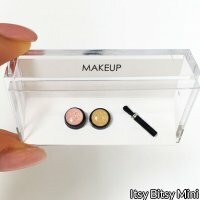 Makeup jars have clear domed non-removable lid. Jar dimensions are 1/4 diameter X 1/8 inch tall (6 X 4 mm). Rounded functional cosmetic brush is 1/2 inch long X 1/16 inch thick (13 X 1 mm). One inch scale.